"I lived in Spain for two years where I was taught the art of making the Paella which originated in Valencia. I haven't found anything on here which is even close to authentic, so I thought I would add this recipe for those who would like to try a taste of Spain. First and foremost you will need a special paella pan called a paellera or just a paella. Trust me after you taste this you'll be glad you bought the special pan." Heat a paella pan over medium-high heat, and coat with olive oil. Add the chicken, rabbit and garlic; cook and stir until nicely browned. Move the browned meat to the sides of the pan, and add the tomato, butter beans, peas, and green beans. Season with paprika, and mix well. Fill the paella pan almost to the top with water, measuring the water as you put it in. This is to help you to determine how much rice to add, as paella pans come in different sizes. Bring to a boil. Simmer for about 1 hour to make a nice broth. Season with a generous amount of salt, and just enough saffron to make a nice yellow color. Season with thyme and rosemary if desired. The goal is to make a rich tasting broth that will soak into the rice to make it delicious. Stir in half as much rice as the amount of water in the pan. Cover, reduce heat to low, and simmer until all of the liquid has been absorbed, about 20 minutes. 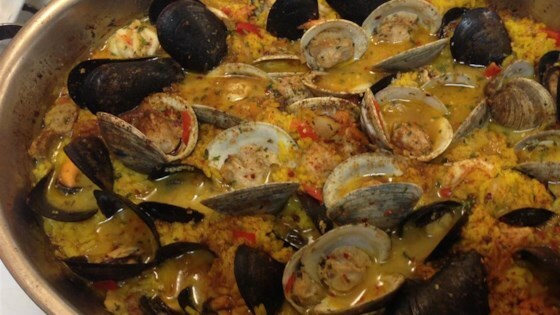 See how to make a traditional Spanish seafood stew. Rabbit can be very hard to find so you can just use a whole chicken instead. It also may be easier to use boneless chicken but then you don't get any fun extras, like hearts and livers. If you do use the hearts and livers don't put them in until later as they cook very fast. They will however add a nice flavor to the rest of the dish. My family is from Valencia and preparing the paella is a tradition to us. This paella is pretty close to the original recipe we have been using for years and years. This is truly authentic- If you can, use fresh peas and a good quality saffron, and this excellent recipe will be over the top! very tasty ... even without a paella pan.